BOULDER, CO--(Marketwired - March 14, 2017) - The Monterey Bay Aquarium Research Institute (MBARI), a private, non-profit center for ocean research and technology development, is working with 3D at Depth, a global leader in subsea optical systems and solutions, on a next generation subsea LiDAR system optimized for autonomous seafloor mapping. MBARI began testing the 3D at Depth SL1 subsea LiDAR system in 2013, incorporating the sensor into an ROV-mounted low altitude survey system that also includes stereo cameras, strobe lights, multibeam sonar, Doppler velocity log sonar, and an inertial navigation system. Using this system on both ROV Doc Ricketts and ROV Ventana, MBARI has achieved 1-cm resolution topography collocated with color photographic imagery over 80-m by 80-m areas in single ROV dives. 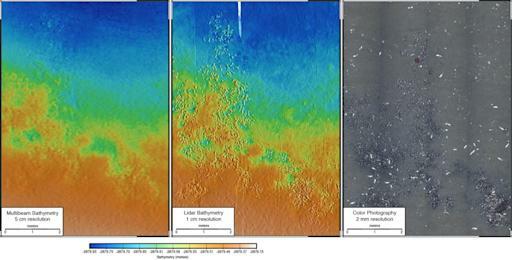 Early tests focused on a chemosynthetic clam community at 2850-m depth in Monterey Canyon, demonstrating that the lidar bathymetry could resolve individual animals and the trails left by their movements (as shown in the attached figure). More recently, the low altitude survey system has been used to map sponge communities on the summit of Sur Ridge and to monitor fine scale seafloor change in Monterey Canyon as part of a large experiment studying sediment transport down this very active canyon system. One of MBARI's highest priorities is to measure and understand change in the oceans, including through seafloor mapping. The success of the prototype low altitude survey system has allowed MBARI and 3D at Depth to define the requirements for efficient 1-cm-scale swath mapping in the deep ocean, and to proceed with the development of a subsea LiDAR system that meets these requirements. The initial testing and use of the new LiDAR will be as part of the ROV-mounted survey system, but ultimately MBARI plans to field the low altitude survey capability on autonomous platforms. 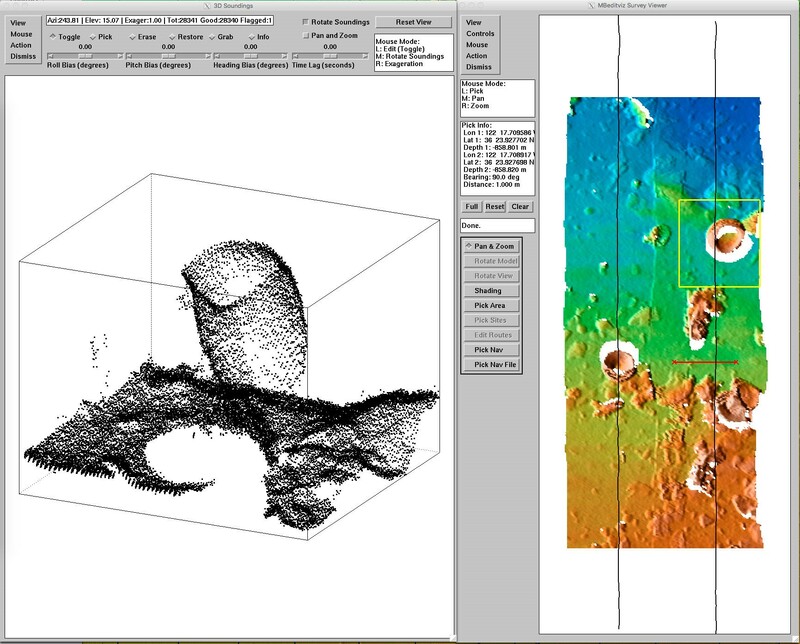 David Caress, Principal Investigator for MBARI's Ocean Imaging project, states "Our desire to achieve 1-cm-scale surveys of areas with complex and rugged terrain requires generating precise bathymetry over ranges from 2-m to 20-m, while our need for efficient use of expensive platforms requires a scan rate and a field of view comparable to other swath mapping sensors. Achieving this performance with a LiDAR will enable us to make fundamentally new observations in the deep ocean in support of our benthic ecology and marine geology research programs." Carl Embry, CEO of 3D at Depth states "We are excited that a prestigious world leading research organization such as MBARI is using our technology to meet one of their strategic goals. The project is truly a win-win for both organizations as it provides MBARI with a tool to meet their scientific goals and this helps us accelerate the development of our next generation Subsea LiDAR (SL) systems for moving AUVs and ROVs." 3D at Depth recently made the news with "World's First Fabrication of Subsea Well Part Using LiDAR Data and 3D Printing" has been the recent recipient of the EEEGR Innovation Award and a finalist for the 2016 Subsea Energy Australia -- Industry Innovation and Technology Award. 3D at Depth, provides advanced subsea LiDAR systems and solutions designed to help clients build, maintain, map and monitor underwater assets and resources. 3D at Depth's portfolio of SL1 and SL2 subsea LiDAR laser scanners combine integrated hardware and software technology to deliver repeatable, millimetric measured point clouds to address the challenges of subsea 3D measurement and visualization. Our solutions focus on increasing the efficiencies and accuracy of data collection and visualization programs for offshore oil and gas, commercial, research and government applications. With office locations in the US, UK and Australia, the company is focused on innovation and best practices to enhance 3D underwater data collection processes.